Horsetails and Scouring Rushes are in a primitive genus (Equisetum) of non-flowering plants. Most of their stems are hollow and have distinct nodes, or swollen areas, where branches are sometimes attached. Both stems and branches have vertical ridges and grooves. Silica, embedded in the ridge tissue, led to the stems being used to scour pans as well as an abrasive for burnishing brass and finishing violins. Common polypody (Polypodium virginianum), also called Rock Cap Fern, is a perennial plant found most often growing on rock surfaces usually in moist, shady woods. Being a fern, Common Polypody reproduces by spores. Structures that produce and contain spores (sporangia) are found on the undersides of the fertile frond leaflets. The sporangia form round clusters called sori. The sori of Common Polypody are orange-brown when mature and lack the protective covering (indusium) that some other fern species have. At this time of year, the mature spores are being dispersed by the wind. 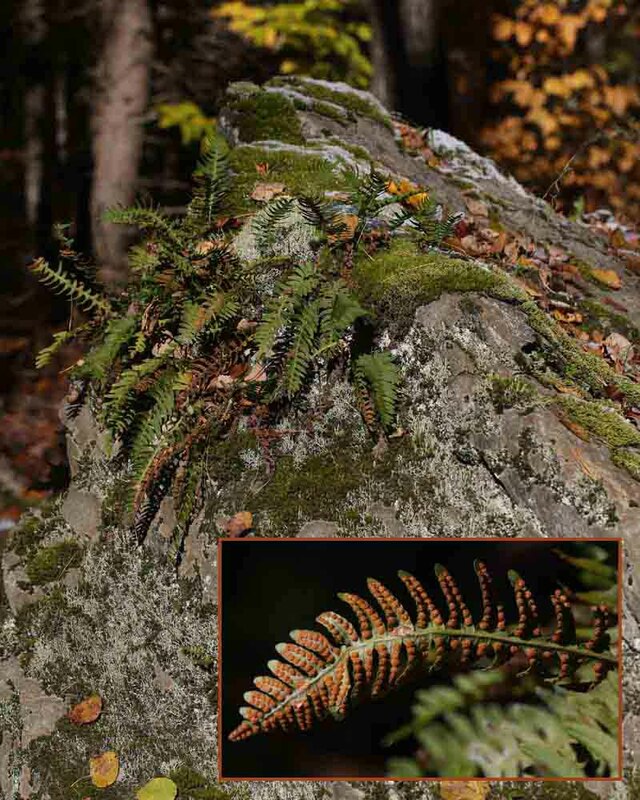 The ability of Common Polypody to tolerate extreme desiccation (the leaves roll up when moisture isn’t as available, and resume their normal state when moist conditions return) means it is well adapted to the extreme moisture fluctuations of rock surfaces. Its evergreen fronds are consumed in the winter by Ruffed Grouse, Wild Turkey, and White-tailed Deer. 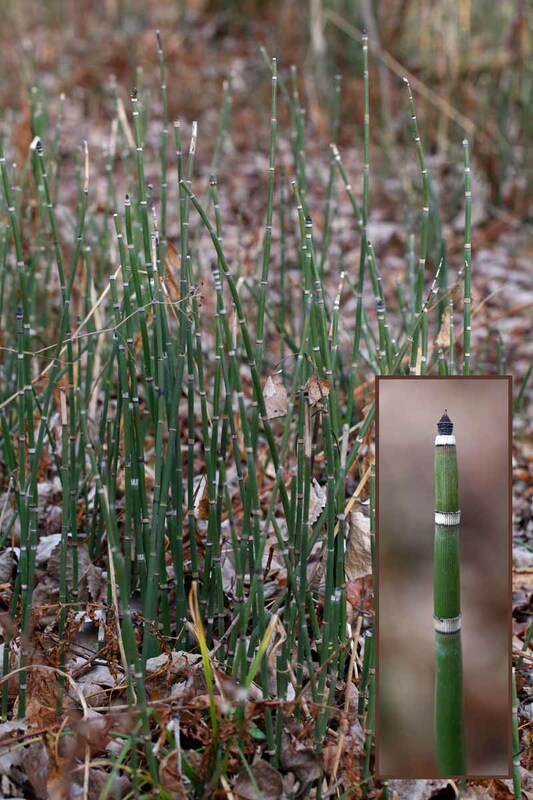 Scouring Rush (Equisetum hymale) belongs to a group of non-flowering, spore-producing plants that are known as horsetails. The group is named after some of the species in it that are branched, and were thought to resemble the tails of horses. There are several species of horsetails, including Scouring Rush, that do not branch. Three hundred and fifty million years ago horsetail relatives dominated the understory, with some individuals growing as high as 100 feet. Scouring Rush’s rough stems terminate in a pointed cone within which spores develop. Their evergreen, hollow stems are jointed (stem can separate easily into sections by pulling at joints) and their leaves have been reduced to small sheaths encircling each joint. Scouring Rush is often found near streams and ponds, and can form large colonies. The stems of all species of horsetails contain silica. Those of Scouring Rush, as one might gather from its name, were bundled together and used as a fine abrasive for scouring pans. In addition, they were used for sanding wood and smoothing reeds for woodwind instruments.